Hometown Orthodontics is proud to offer a range of options for braces in Mississauga and braces in Sudbury. Whether you are excited (or not so excited) about orthodontic treatment, we give you great options to achieve a confident, healthy smile! When we discuss braces with our patients and their families, most moms will tell their children that metal braces have come a long way since they had orthodontic treatment. Metal braces are more streamlined, they have a smaller profile and they take less room up on a tooth. Best of all you have the option of choosing some awesome colour combinations to add bling to your smile. Every visit, Dr. Virdee and her staff will change the coloured elastics or rubber band on your teeth as you progress through your orthodontic journey! Traditional braces are an option for anybody, not just young teens. Ceramic braces (also known as “clear braces”) are one of the best aesthetic alternatives to traditional braces. These braces look and function the same way as traditional braces with the exception that they are virtually clear or tooth-coloured. They are fast and efficient and give you a healthy, confident smile without the attention that metal braces may give. Ceramic braces are also an option for patients with nickel allergies. Ceramic braces are just one way that Hometown Orthodontics strives to deliver you the latest technological advances in orthodontic care. Traditional braces are not like they used to be! The oldest patient at Hometown Orthodontics is 76 years old! Gone are the days that braces were uncomfortable or painful. Gone are the days when orthodontists placed braces for more than 3 or 4 years to give patients a confident smile. Gone are the days when braces were large and took up extensive space on your teeth. Today’s braces are more smaller, streamlined and take up less surface area on a tooth. This means that it is easier to clean around braces – whether they are clear or metal. They are also much more comfortable – and today they are fun! You can choose whatever colours you want on your braces, whether you are clear or metal the choice is yours! (psst….these are changed every four to eight weeks so go ahead and be adventutous). We recommend metal braces for children, while teens and adults can chose from clear or metal braces. Self-ligating braces are unlike conventional braces that require tying or ligating the wire with a rubber tie to the bracket or brace itself. Self-ligating braces have a smooth metal door that helps to hold the wire in the bracket and, unlike a rubber tie, allows free movement of teeth along the wire. Patients with self-ligated braces have shorter adjustment appointments, less frequent visits to the orthodontist and better oral hygiene. 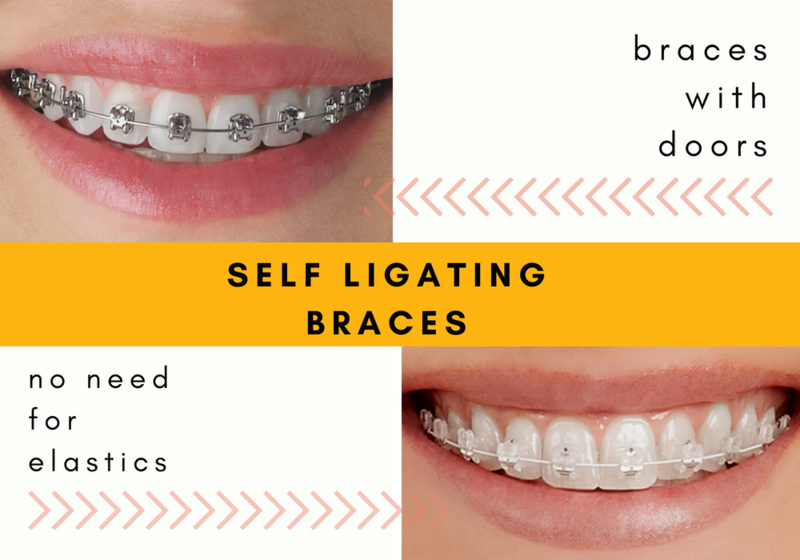 Self-ligating brackets are another way that Hometown Orthodontics delivers the best that orthodontic care has to offer. In recent years, a brand of self-ligating braces called Damon Braces has made waves with patients through heir marketing campaigns. This company suggests that their braces move teeth faster and minimize the need for extractions. However, well-documented studies by reputable orthodontists conducting research on Damon braces and other brands of braces show no advantage from one brand to the other. In fact, there is no difference in overall treatment length between traditional braces and self-ligating braces. Damon braces use a wider set of wires than typical orthodontic wires. These wires widen the arches and sometimes minimize the need for extractions. However, these wires can be used with any types of braces and are not exclusive to Damon alone. While we continue to bring the latest in technological advances in orthodontic care, we also want to assure our patients that all our treatment methods are ethical and based on sound scientific research instead of flashy advertising. After all why would you pay a higher price for brackets that are marketed as a “premium bracket” only to achieve the same results, with the same comfort level and in the same amount of time! How are braces bonded or installed on teeth? Bonding braces to your teeth is a painless process (it’s like putting stickers on your teeth). After cleaning your teeth, we use a special solution which “etches” the surface of your enamel. The etchant is usually blue or green and can taste sour. The enamel is then coated with a primer which penetrates the etched surface of the enamel. This primer creates a link from the enamel to the dental cement that is placed on the back of the braces to provide a strong bond between the tooth and enamel. The braces don’t really move the teeth. The wires that are fastened to the braces with coloured elastics or doors in the case of self-ligating braces are the real movers and shakers! What is done at each “Adjustment” appointment”? Typically we see each patient at 4-8 week intervals. During this time we will make adjustments to the braces or change the wires. Ultimately this will result in the teeth getting straighter. Once we are in larger wires, we may prescribe elastics to help correct your bite. Dr. Virdee will prescribe the type, duration and placement of elastics for you. The better you follow her instructions for elastic wear the sooner treatment can be finished. Braces fell like small jewels on your teeth. It takes about a week or two for your lips and cheeks to get accustomed to them – after that they feel like a part of your body. In fact when we remove braces, many patients tell us it feels weird not to have them anymore because they are so used to them. While your lips and cheeks get accustomed to the braces, we suggest using wax as a bumper should they bother you. Braces aren’t painful, but they can be uncomfortable when they are initially placed. The discomfort isn’t necessarily from the braces themselves, but from the wire moving the teeth. This just means that you’re on your way to straighter smile! Typically our patients tell us that their teeth feel the same way that sore muscles do when you haven’t gone to the gym in a while. If you are especially uncomfortable, we suggest taking an Advil to help with the symptoms. At Hometown Orthodontics, we aim to keep your treatment as efficient as possible. This means the shortest treatment time possible. This is why we wait until all the permanent teeth have erupted prior to starting orthodontic treatment. Dr. Virdee prides herself in limiting most treatment times to a maximum of 18-24 months depending on the severity of the case. However, this comes with a responsibility from the patients as well. As long as you keep your teeth clean, wear your elastics well, minimize any broken brackets, treatment time is usually on par with what Dr. Virdee states at the initial consultation. What foods must I stay away from while I have braces? We generally say you can eat whatever you like when you have braces, but you must change the way in which you eat certain foods. For example, you cannot bite into apples, carrots or pizza crust any more. We suggest that you cut these into smaller pieces and chew on them with your back teeth. Absolutely no hard or sticky foods (jaw breakers, caramels, unpopped popcorn kernels, Tootsie Rolls etc) and gum. These foods break the braces which tends to increase your time in treatment and increase your risk of white spot lesions or decay. What about brushing with braces? You may use an electronic toothbrush or a regular toothbrush to remove the plaque off your teeth. Technique matters less than the type of toothbrush. We also suggest using a proxy brush to get between the braces and underneath the wire. Typically you should brush your teeth 2-3 times per day or after each meal. If it is difficult for you to brush at school, we suggest taking time out for this after school when you get home. It is advised to floss daily to keep your gums healthy. Braces for all ages in a boutique setting where Dr. Virdee sees you at each appointment. Schedule a complimentary consultation with us today.